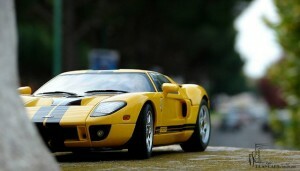 Ford GT keeps the racing profile of its predecessor, a car which wrote history in the motorway racing. 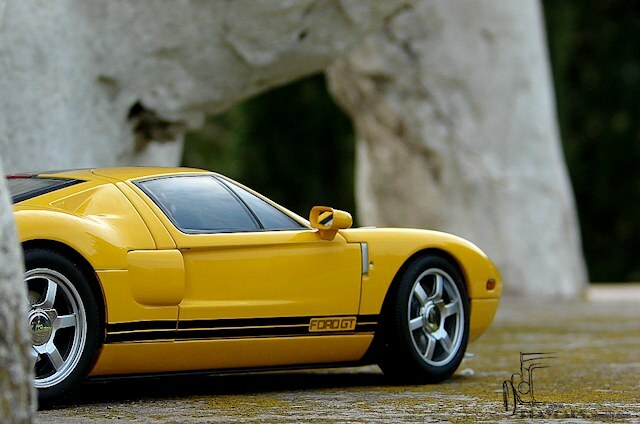 The classic lines of GT40 were perfectly integrated in a modern body and of course the performances reached a high level. 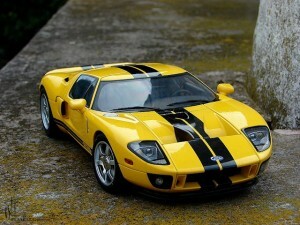 If we are to speak about Ford GT, we put in evidence the most famous American supercar. 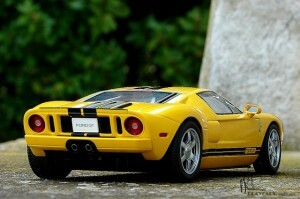 For my review article this will be the subject, but the 1:18 scaled Ford GT by AUTOart. 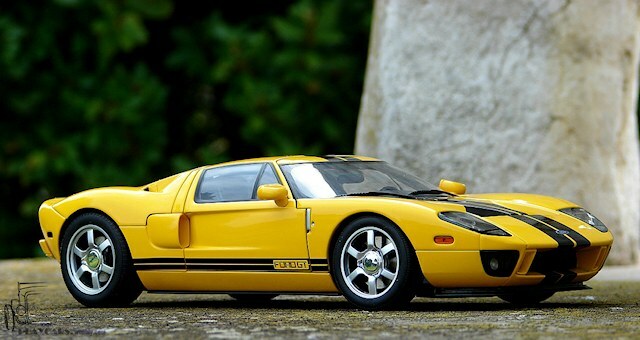 A very beautiful model like the car itself which, was brought out back in 2005. 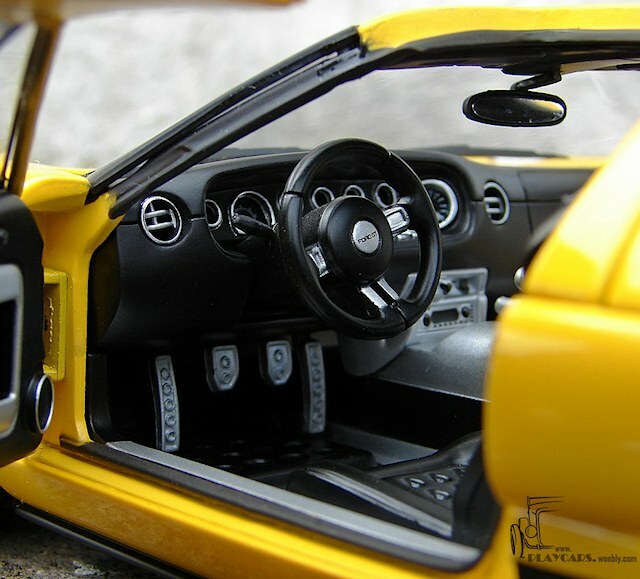 Is the first supercar made by AUTOart and is a part of the Millennium series. 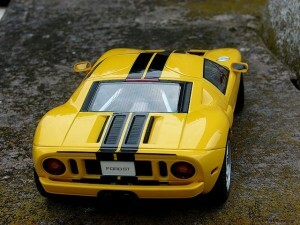 The model was a fantastic success and quickly became a rarity. Many years were needed to have this model in my hands and for sure it was one of the best experience since I’m involved in this hobby. It keeps the classic polystyrene box and the additional card box specific of the first Millennium models. I had it in yellow on my wish list, even if I must admit is better looking in red with white stripes, but because of its rarity I didn’t have the opportunity to chose between them. 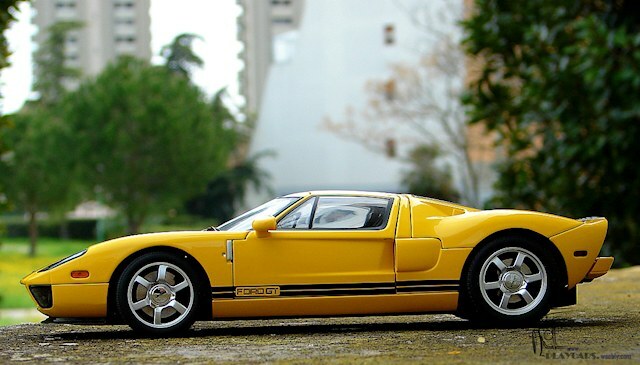 A dark blue with white stripes will be the perfect combination for a further re-releasing of this model. In fact, it was announced in other colors, but after 4 years nothing new. So, let’s turn back to our model and take a look on it. 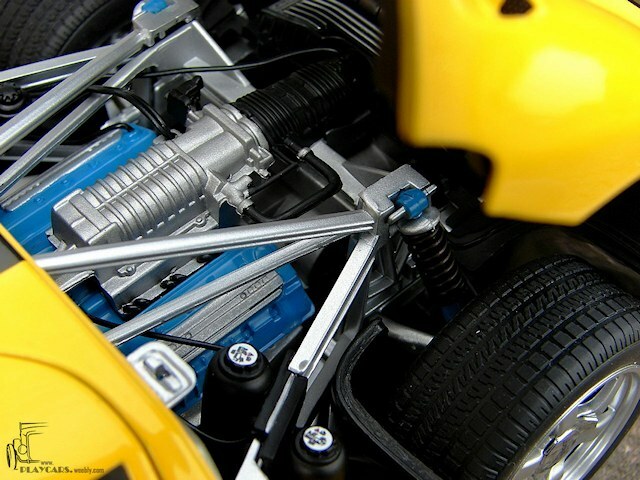 Is heavy, have big proportions just like the real car, is made with many metallic parts, the gaps are minimal and feels very solid and good put together. The paint job is good, not so thin and glossy like on the newer models, but nothing to complain, excepting the few zones around the body hollows where is extremely thin applied and the metal tint could be seen through. I repeat, is nothing to complain about, because is visible only when are you watching the model very close. The stripes are painted and very precisely, including the car name above the sills. From the exterior the model is very beautiful and looks realistic. Headlights details are looking decent, but not actual and is easy to see where Aa improved their detailing. The lens and all the interior were chromed to replicate the reflexive area and for sure this was the best solution for a model made 9 years back. The turn signals have an orange tint and the fog lights were attached with visible stubs, but appears to take the light bulbs place. For the turn lights included in the fenders the stub is visible, too. No such problems for taillights which are realistic and keep the original colour scheme. Ford logo is an individual piece, good detailed and legible and all the air vents are covered with real mesh, on the front side being metallic made. On the rear lid the air vent isn’t cut in, but have the parts well replicated. I like how they moulded the discrete “lip” under the front bumper and the fuel lid as an individual part, silver painted to replicate the real aluminium and having the car’s name moulded in. Only the car’s tail is plastic made and because I’m in this area I must say that a beautiful job was done reproducing the air splitter and the grill above it, which is perforated, of course. And now the best part of the exterior, the wheels are a sweet view! Are very precisely moulded, keeping the real design which appears to be very simple on a quick look, but once viewed during the lateral line reveal a curved profile for the spokes. The lug nut is a raised part, carefully moulded, a remember of GT40’s blood lines, covered with a qualitative chrome and marked with the car’s name. Disk brakes are the best ever made by AUTOart. Are covered with a fine metallic cover to replicate the steel and finally the fake cross drilling process was made in scale. 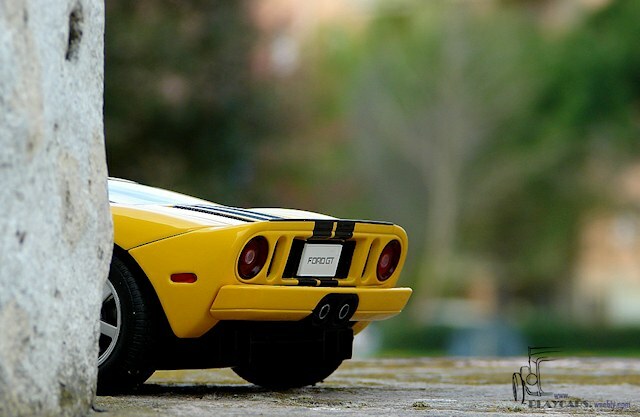 The dimples have the correct size and look for 1:18 scale. Not paint or supplementary marks for the calipers and for the rear disks the additional hand brake’s calipers were added. Tires are made of soft rubber are feeling realistic, but their side walls aren’t branded. Try to use a tool for opening the doors, because the gap is very thin. The interior is looking very good revealing buttons and switches moulded everywhere and individually marked, legible indicators which are better looking in real and cut-in air vents. Like in the real car the carpet isn’t available, only a texture applied to the plastic surface and the legs rest place is present. Only the pedals are looking a little bit oversized in my opinion. For the seats the real design was carefully followed, but the air vents have not the chromed circles around each one. Thinking better how they could do this, the silver painting is the answer and I’m in doubt about the final result. In conclusion letting the seats without this detail was a better choice. The intriguer front lid is opening on very fine hinges revealing a huge metallic grill and a plastic panel including a lid and a grill modeled and individually painted. Two cooling fans were moulded and hidden after the metallic grill. 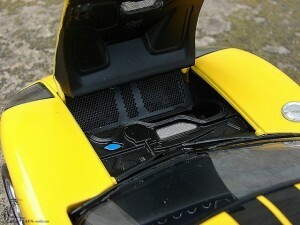 On the rear side the engine can be observed first, trough the lid’s engine which have the demister system replicated. The lid is huge, including the third lamp stop, only painted in a strange shade of red for this purpose and doesn’t stay open by itself. Including a rod wouldn’t be a bad idea. 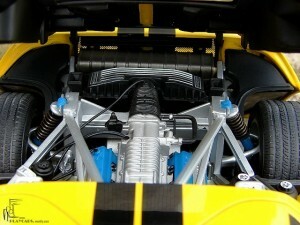 The engine is great looking and detailed, having separate pieces and containers, marked lids and wires. Is visible the tubular chassis frame, the suspension with separate metallic springs and the exhaust, painted in a very proper color. 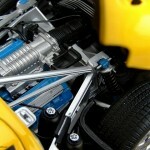 Underneath nothing can be seen, except the suspension with metallic springs for every wheel and the rear air splitter. 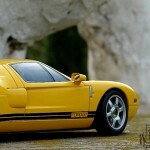 6 Responses to "REVIEW: AUTOart Ford GT"
I can’t wait for the new version to be released this year! Not sure if the model is new, maybe a few upgrades, but the base will be new available colours. Not to rain on your parade but they are not yet 100% confirmed for 2013. How many red 1/18 scale GT’s wer made? Not sure, not many we suspect. This is the second production run of this fine colour.